Three more classic and top quality British films from the much-loved and fondly remembered Children's Film Foundation (CFF) are released together on DVD on 18th February 2013 in The Race is On. In this second BFI collection of CFF films, a young Michael Crawford stars in Soapbox Derby (1957), there is the imaginative, air-borne adventure The Sky-Bike (1967) and cult favourite Sammy's Super T-Shirt (1978), one of the most sought-after CFF gems, is finally available to be enjoyed again by its original fans and a new generation of youngsters. For over 30 years the Children's Film Foundation produced quality entertainment for young audiences, employing the cream of British filmmaking talent. After many years out of distribution, the BFI is releasing a selection of the films in specially curated and themed DVD editions, newly transferred from the best available elements held in the BFI National Archive. Denis Shaw (The Colditz Story, Curse of the Werewolf). Writing for the DVD booklet, Michael Crawford says what great fun it was making the film: "We were all required to do numerous 'daredevil' stunts...being paid to do things that you would ordinarily be arrested for!" In The Sky-Bike, all Tom Smith can think about is becoming a pilot. When he accidentally stumbles across a prototype man-powered flying machine, he convinces its eccentric inventor, Mr Lovejoy, to let him help get it off the ground. Working in secret, the two prepare their 'sky bike' for a high-stakes race. Liam Redmond (Night of the Demon) plays the mastermind behind the flying machine. Despite his size, 12-year-old Sammy, star of Sammy's Super T-Shirt, has set his heart on winning the Junior Superstar Challenge Cup track race. His secret weapon, a lucky tiger t-shirt, takes on a life of its own when it accidentally becomes part of a top-secret scientific experiment, which gives its wearer awesome super-strength. Featuring a comic double-act by Richard Vernon (Goldfinger) and Julian Holloway (Carry On, Disney's A Christmas Carol) as the nefarious scientists, this is one of the best-remembered CFF productions, which has even generated an online petition for its release. 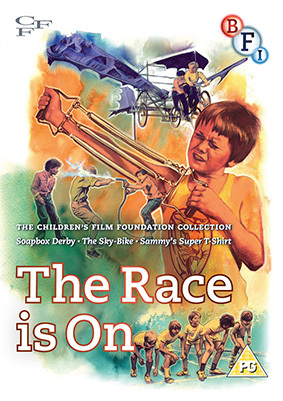 The Children's Film Foundation Collection – The Race is On will be released on UK DVD on 18th February 2013 by the BFI at the RRP of £19.99.